Alternative title: the day I three putted 7 of 9 holes whilst anxiously reflecting upon my desire for golf girlfriends and trying to tell myself that that's ok and not let existential dread ruin my day. 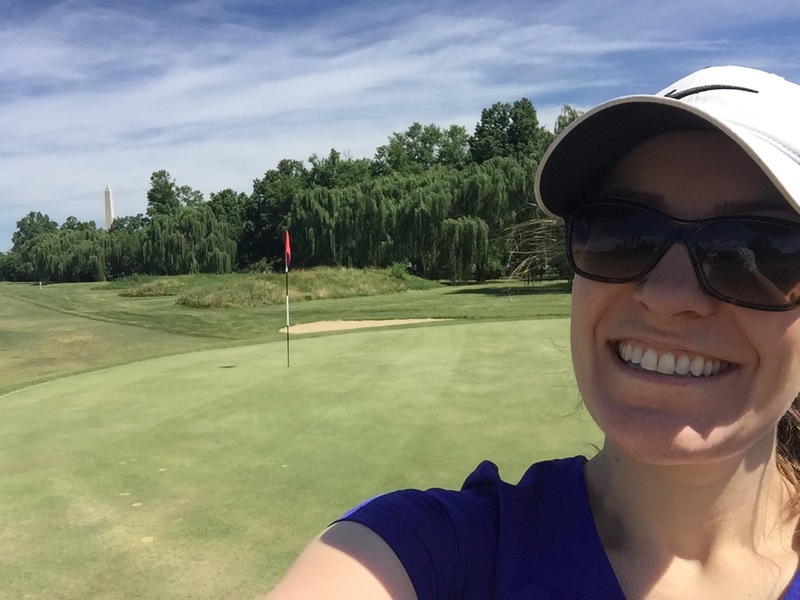 So this week, as I was taking the above selfie during a random Tuesday round, I realized it was a little refresher of my adult golf life up to this point. By and large, it has been extremely lonely. My high school years didn't provide a lot of golf girl friends since I started relatively late as a sophomore, but, I didn't think too much about that at the time. College golf was a blast, and my closest friends were on the team with me. Post-college, however, it has been hard to find girls (I guess we're actually "women" now) to golf with. The Texas town of about 300,000 my husband and I lived in had no women's league, and probably about 5-10 women who golfed anyway, and always when I was working with the team. Because we lived two hours from the closest major city, I was turned away from golf associations there because of my out of area zip code. An attempt late in my time there to start a women's league fizzed out (because again, 10 women played...). In five years the city course hosted one actual women's championship (after giving first place several years in a row to a really talented golfer by default, and I still can't decide if that was a joke or serious), and I came in third of four, one of which was a college team mate I brought down from Austin to play. There were technically coed but basically all male leagues I could have played in, but I just never felt comfortable with the older men there. For one, cheating was rampant in that crowd. And secondly, a few in particular just flirted way too hard and it was weird. A lot of my husband's coworkers played, but in our social circle I didn't like the idea of being the woman playing golf with all my friend's husbands, hanging with them while they drank beer and complained about life and work. I'm not sure I can describe it, but it just didn't feel right. One Christmas my dad, husband and sister played with me, which was a blast. But beyond that, my husband, a novice, worked a lot and did shift work, making golf the furthest thing from his mind on his days off. So whenever I could play for those five years, 90% of the time it was by myself. Ok, more like 95%. And that's hard, because this is such a social sport. Without anyone to play with, I spent a lot of time in my own head. I would try to keep score but often fudged it a little because it didn't matter. I got a lot of gimmies and mulligans, which doesn't keep your game very sharp. I also lost a lot of balls for the silly reason of having poor eyesight, even when the ball would be well-hit to good locations. That isn't to say there aren't perks to playing by yourself. With a cart, I could easily do nine holes in about an hour and a half, especially if the course was empty (as it often was in the Texas heat). And much like runners have a lot of good ideas when they go out to run, I sometimes would have fabulous brainstorm sessions out there walking on my own. And I never worried about awkward chit chat. But now that we live in a big metroplex, I've been determined to grow my circle of friends through the game I love. I joined a ladies league, which has helped give me ladies to play with, even if it hasn't given much in the friends category yet. I'm about 30 years younger than the other ladies, and while I do enjoy their company, I just know I might not be making best buddies. And so when I saw the flyer for a tournament this week for ladies only, I was determined to play. Entry fee was only $45. I had two weeks to prepare, and much of that time was spent finding a babysitter, which fortunately worked out. But then I called to sign up, and was turned away because I didn't have a team. It was a two-person best-ball format, which I knew, but I guess I figured they would have a list of singles to get paired together. So I shamelessly abused our league's mass email list to see if anyone wanted to play. No bites. I downloaded the Golfmatch app, but the five or so women golfers in my area that I could find all work during the day. No tournament for me. So rather than cancel the sitter, I decided to use the day to play in DC or Maryland. I have a mission of playing in all 50 states and the territories, so I wasn't going to squander an extra morning to do so. 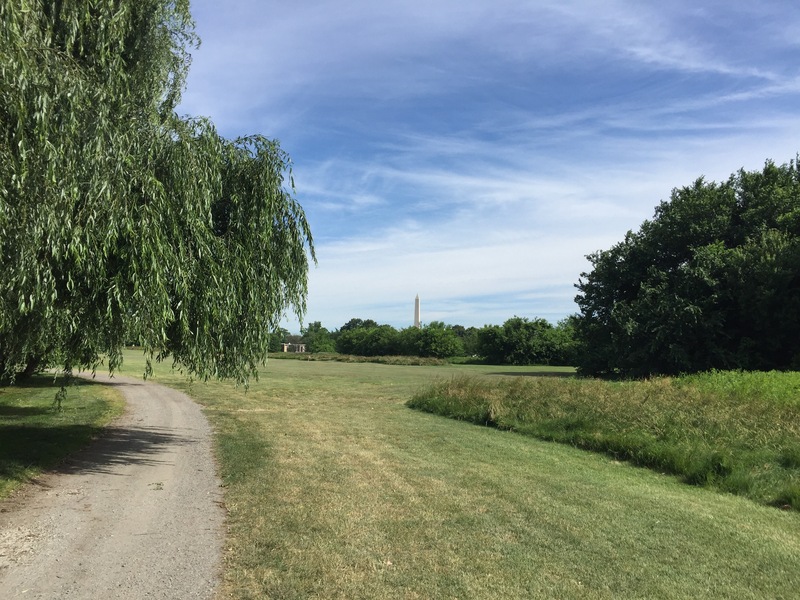 I settled on the executive course at East Potomac Park, a.k.a. Haynes Point, in DC. It's one of the three courses in the District, and was the only one with open tee times that day. Not wanting to spend a lot on the babysitter for a solo, semi-pointless round, I figured walking nine holes would be good enough. 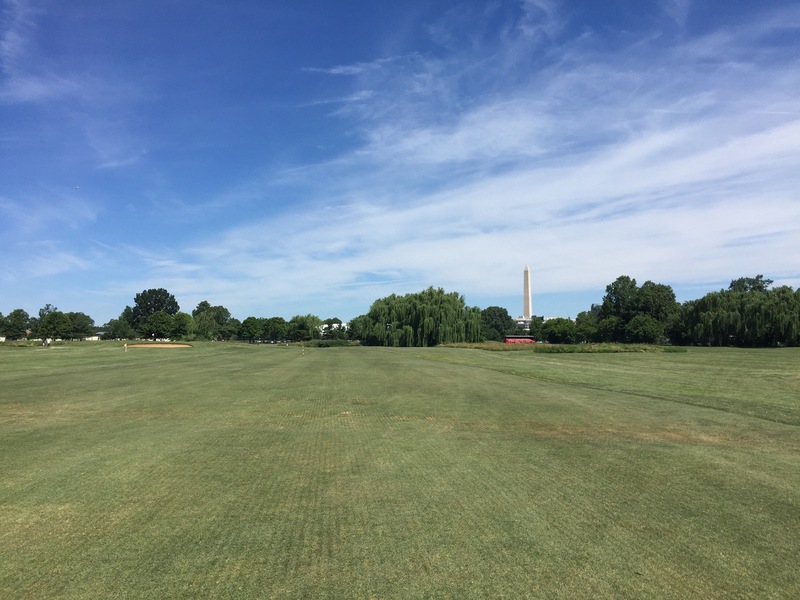 It's a fairly flat and basic course, and I could see it working well for groups with mixed golf abilities. Plus it was alwesome to actually drive the ball, something I don't get to do playing par-threes every week. It's pretty open so it felt nice to swing away, plus I got some great bounces. You catch the top of the Washington Monument and some of the Jefferson Monument. The greens are elevated and some of the pins felt oddly placed, but it was decently maintained. As for how I played, I hit the ball beautifully but putted like crap. My 11-over could have been only 4-over without the seven three-putts! Didn't allow myself any mulligans of gimmies this time since I want to be sharp for league play Friday. It was nice, and it was fun, and the morning was beautiful, but I was extremely lonely. I was reminded about how grateful I am to be in a ladies league, even if it means that I am about 30 years younger than my competitors. In that way, I kind of have a renewed energy for my Friday morning rounds. Guess I needed that perspective shift. I'm not trying to get any pity about it, I still love the game and would play every morning if could, playing partners or not. And yes, in my quest for golf friends I would be happy to play with some nice guys too, but I guess I crave the friendly sisterhood golfing with women creates. I'm hoping the GolfMatch app works out in the long run. I'll definitely report if anything happens there!